So here we are, where we left off not quite two years ago when I took the job at Grub Street Chicago; the procession of high end meals will surely slow for me at least for a bit, and it’s back to ethnic food in farflung bits of town— not that I ever stopped that. Maybe it’s just me, but it seems a nostalgic, taking-stock kind of moment; LTHForum is going through a blush of love for a place called Rainbow Thai that seems to be trying to recapture those heady times in 2004-6 when Erik M. was schooling us all on Thai food beyond pad thai and chicken satay, and I was reminded of another round of discoveries by a Tribune piece last week on Almawal in south suburban Worth. It seems recent compared to the Thai discoveries, but it was four and a half years ago that I wrote about the enclave of middle-eastern restaurants (and shops) in south suburban Bridgeview for Time Out (with accompanying blog post) in early 2009, further LTH exploration ensued including Almawal (which didn’t exist yet when I first wrote about the area), the best of them, Al-Bawadi, became a GNR, Mike Sula in time would uncover a sweet shop and Sheeba, a shortlived Yemeni restaurant, down there, and so on. I tried Almawal a couple of years ago and thought it a fine enough place but not better than Al-Bawadi— and I was not positive, based on the meal that I had, that they charcoal-grilled their meats as Al-Bawadi had. Based on what others have written, they must, but it’s something of a verdict on the results that day that I couldn’t be sure. Anyway, after Pang’s Trib piece I thought it was probably time to give them another shot… unless I found something else new to try. 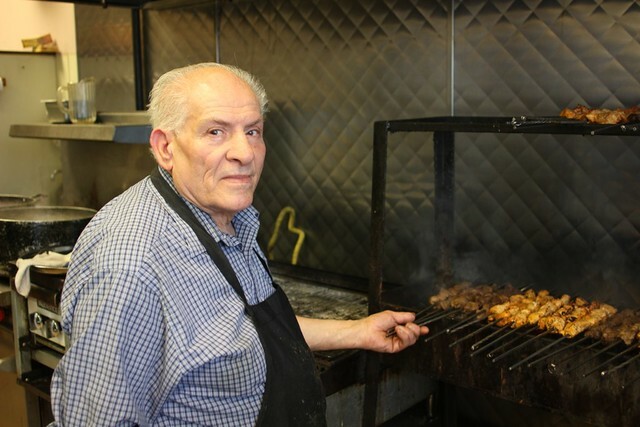 Here is a Palestinian grill man to be spoken of in the same breath as great barbecue men, as Michael Cheng the duck roaster of Sun Wah, of all the brethren who devote their lives to perfectly executed meats over live fire. So add Manara Restaurant to your list of places to check out in the Bridgeview area— though as we were driving off I noticed that another of the places I had visited 4-1/2 years ago had changed names and presumably owners again, and was now a place called Yazor Kabob— also promising charcoal fire. So I have that to check out too, now— though I was also made ever more conscious of an irony on the Bridgeview dining scene. 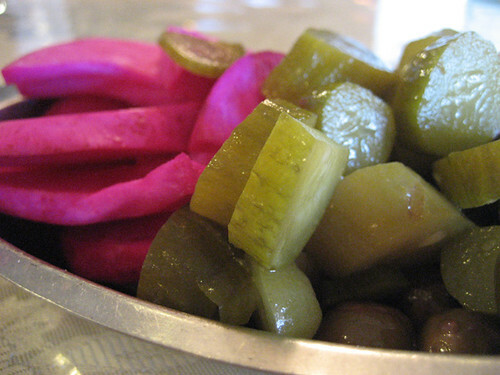 The middle-eastern places promise charcoal fire and always have it. The Mexican places promise Tacos al Carbon— and never have live fire. If just one of them would follow the middle-eastern places and start burning charcoal instead of a gas grill, Bridgeview might be a destination for Mexican as well as middle-eastern. A couple of sweet-looking ladies running the place, all kinds of authentic things on the menu… Taqueria Teloloapan in Logan Square is the kind of place I should have loved. So what went wrong? First, I ordered a chalkboard special of chicken in salsa verde. The salsa verde was bright and tart. It was the chicken that was the problem— which is to say, I didn’t expect exactly half a chicken. I figured I would kind of get scraps, most likely as the breast was used as somebody else’s entree. But I could have at least had the thigh, no? No, I got a small leg, a skinny wing, a hunk of bony back and the hacked-off pointy end of the breast— maybe a third of a cup of meat. At $4.99, I might have figured that was acceptable. At $7.99, enough to buy me a whole roasted chicken at the supermercado down the street, it was just chintzy. Then there was the sign in the window that said Tortillas Hecho a Mano— made by hand; something that can redeem an otherwise middling meal. Well, not the ones that I got. A comment on Yelp says you can ask for them that way, though. Okay, fine. I will also tell you that you can ask for them that way— and that you shouldn’t have to when it says it in big letters like that on the glass storefront. 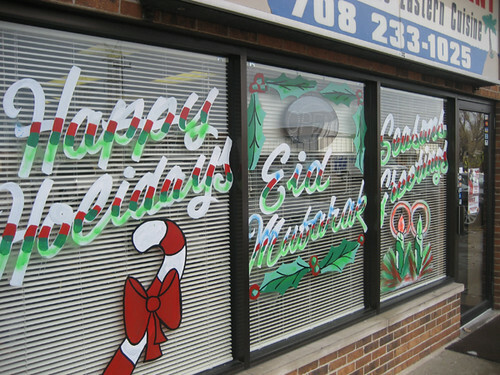 That’s a sacred trust, a promise in vinyl letters on glass, not to be trifled with. I’ll give it another shot someday, what there was tasted good and the ladies seem like they’re nice… but I’ll be more careful about ordering the not-so-special special, that’s for sure. Speaking of 2008 or so, I was finally downtown at the right time to hit a place that had its day of fame around then, which I had never been to: Cafecito, a Cuban sandwich shop in the South Loop which is bedecked with aging clippings from all the food press of the day; Sula profiled its owner here, declaring it the city’s best Cuban sandwich. Me, I think the best Cuban sandwich, if not the best “Cuban sandwich,” is a lechon sandwich at 90 Miles To Cuba; I like that better than the grilled Cuban concoction of ham and roast pork with cheese, mustard and pickle. But even within that specific sandwich’s universe, I was unexcited by the Cuban sandwich at Cafecito, which was mostly a hard Gonnella roll with very thin quantities of pork and ham. Is the pork marinated in the guy’s housemade mojo, baby? Who could tell when it’s a couple of nanometers thick? I wouldn’t write this off, there’s a long menu and maybe soup is the thing to try, but it was hard not to think that 2008’s best Cuban sandwich isn’t so great in 2013. It sometimes seems as if there are no more food discoveries to be made in Chicago. The truth is, while it may be harder these days— though far from impossible— to find unknown places in Chicago, there are all kinds of unexplored suburbs around the city, especially in less-traveled-by-internet-users areas like the south suburbs. So don’t think it improbable if I say that as far as I am concerned, the best middle eastern food in Chicago is in an area that has gone almost entirely undiscovered (with one exception) until now— that at least half the times I’ve stopped for food there, I’ve had middle eastern food that for brightness of flavor, freshness of preparation, and the hospitality with which it was served handily surpassed almost any middle-eastern meal I’ve ever had within the city. 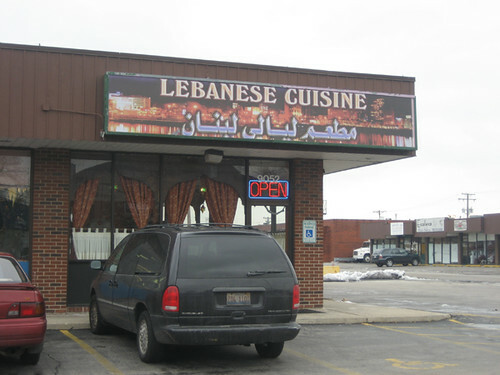 After repeated middling experiences at what I’d long considered the best of them in the city— Salam— and adjusting my expectations for middle-eastern downward, the food in and around Bridgeview has given me new hope for the existence of an authentic, lively example of this cuisine in Chicago. I chronicled these explorations and discoveries in my Time Out “Taste Quest” last week; this will offer some notes and further explication of that piece, which I would recommend as the primary, easily referenced primer for the explorer. I had vaguely known for some time that there were middle eastern restaurants down in this area (which, to help set the scene, is located straight south of the city on Harlem avenue in the 80s and 90s, mostly; or in foodie terms, it’s about a mile southwest of Chuck’s). In fact Salam even had an outpost here at one time. The Arab community here— mainly Palestinian— originated in Chicago’s oldest middle eastern area, which was in the South Loop, and for many years they were the shopkeepers for the south side black community, both necessary and resented by the local population (a la Korean bodega owners in black neighborhoods today). The community moved over time to the area around 63rd and Pulaski, and there are still some remnants of it there; I took part in an event during the time between the abandonment of Chowhound and the launch of LTHForum in which several of us ate our way up and down 63rd, checking out the restaurants and shops that existed then. 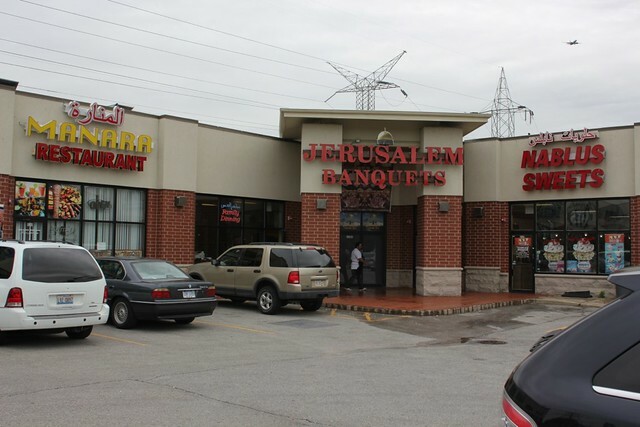 However, when the best known to us of these, Steve’s Shish Kabob, closed up around 2006 (eventually reopening somewhat to the southeast of Bridgeview), the whole south side Arab community kind of fell off the local foodie radar. To get back to its history rather than mine, the community had started looking for a place to build a mosque as early as the 1950s, and a Bridgeview mosque was built in the 1970s. The Bridgeview mosque has inspired controversy which is best understood by perusing the Chicago Tribune’s series of articles on it from a few years ago, but whatever may be happening inside it, the commercial activity around it remains warmly welcoming to the outsider, if to judge by appearances, rarely seeing many from the Irish, Poles and Lithuanians who also live in the area. 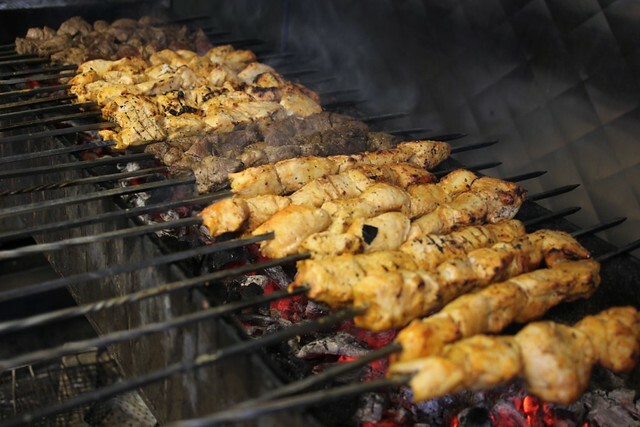 Al Bawadi is located in a former fast food building, which they are in the process of expanding so that they can have a nonsmoking original building and a separate hookah room. The building looked vaguely Alamo-like, but I couldn’t quite place it, so after our meal I asked our waiter if it had been a Mexican restaurant. He clearly thought I was asking if the meal we had eaten was Mexican food, and, eyes bulging in disbelief and dismay, carefully explained to the astonishingly stupid gringo (who somehow knew baba ghanoush and falafel by name, but apparently believed them to be salsa and chips), that the restaurant was Jordanian-Palestinian. Eventually I got out of him that the building had once been an Arby’s, but I’m not sure I ever convinced him that I hadn’t mistaken his place for Senor Sombrero’s. This is a second outpost of a restaurant that still exists on the 63rd street strip (the similar-named place in Hyde Park may have been related once as well; or “The Nile” for a middle-eastern place may be “Great Wall” for Chinese restaurants). The cafeteria-like atmosphere is nothing to get excited about, but the bustle behind the counter suggests that they’re doing more than lazily serving up falafel— mensef was the special one day I came in here. (The specials board is in Arabic, so you have to ask.) I didn’t have the mensef, I wanted to just try the regular menu (and being on deadline, I had another lunch ahead of me that day, so I didn’t want to order big), but the shish taouk was grilled spot-on perfect and the falafel were bright and flavorful. It’d be worth checking out again. This was one I found by searching the internet, as it’d be easy to miss it on a side street off Harlem. (I don’t have much use for Yelp generally, but it sometimes at least alerts you to the existence of places that locals have commented on that otherwise have gone unnoticed by the internet.) 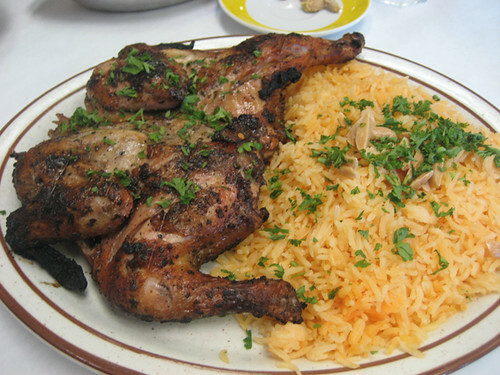 The first time I went I had an absolutely fantastic grilled chicken off the specials board (again, in Arabic only), perfectly grilled (do we detect a theme?) and accompanied by a kind of red pepper sauce. I had planned on a second lunch that day as well but the idea of not finishing that chicken while it was warm and crispy was unacceptable. Baba ghanoush— not that I needed anything like that with this chicken— also impressed me as smoky and delectable. I returned about a week later with LTHForum poster Gastro Gnome, who had agreed to accompany me to visit some of the groceries and markets and help me understand where the points of distinction were so I could include a few of those in the Time Out piece. We started with lunch at Baladi, ordering off the regular menu, and… it was one of those times when the second visit completely fails to show your guest what had wowed you the first time. Everything (shawerma, shish taouk, etc.) was okay, but nothing sparkled. So I guess stick to the specials at Baladi; that chicken really was great. I’m not imagining it. 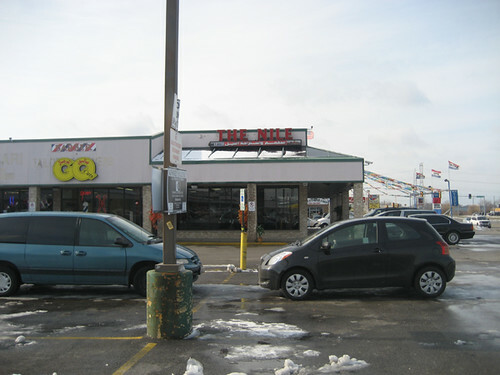 This is the only Bridgeview restaurant I tried that didn’t make the Time Out piece at all. (Al-Basha didn’t make it because it was too far away from the others.) The location is actually where Salam’s outpost used to be, and it was something else in between (as my take-out bag indicated). I ordered a Lebanese shawerma sandwich (shawerma inside a thin wrap with pickles and so on) and a side of foul, beans. Running the place (seemingly singlehanded) was a sort of pepperpot lady in a full hijab. She couldn’t have been more warm or welcoming, and I was ready to love this place… but the food just didn’t do it at all. The shawerma was kind of mealy and tough, and the foul, despite giving off waves of garlic, was flavorless in that way that only bean dishes can be. Too bad. This small shop would have been easy to miss in the same strip mall as Albawadi, but I’m glad I didn’t. They sell a variety of baked goods stuffed or topped with things like za’atar (a green spice of herbs and sesame) or mohamara (a spicy red pepper topping), dirt cheap and, if not mindblowing, totally easy to like. Not surprisingly, it was the one place where I saw non-Arab customers— the Irish kid delivering Pepsi chimed in to urge me to try the potato filled one. The owner (you can see his picture at Time Out’s site) clearly takes serious pride in his wares, as he was very insistent, almost worriedly so, that I not under any circumstances microwave the ones I took away (hey, I’d already had two lunches), but warm them on a cookie sheet in the oven. I did, they made a great dinner that night. I tend to think of things like baklava in terms of David Mamet’s line that there’s no difference between good flan and bad flan, so I included a couple of sweets shops in the piece, but hell if I have any way to tell which is better than the other. 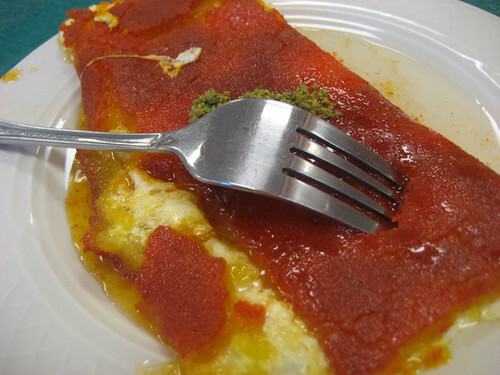 This place stood out for one offering I’ve never seen anywhere else— knafeh, a dish made of warmed white Nablus cheese, topped with orange shredded wheat (once saffron-colored, I imagine), ground pistachios and sweet syrup. I could only get through half a piece, it was so rich and sweet, but I was assured on the weekends, they line up for it. 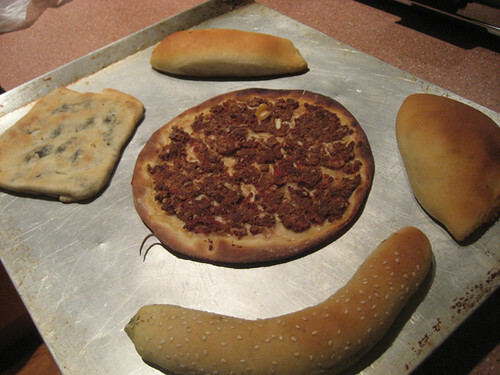 So a few installments of my “restaurants that haven’t been talked about on LTHForum or all that much anywhere else” ago, I wrote about Al-Basha, a middle eastern restaurant in a south suburban strip mall where I found that a menu of familiar favorites was distinguished by unusually fresh and bright flavors, ranking among the best of such things as shawerma, falafel and baba ghanoush that I’ve had lately. Today, in a change of pace, I present Al Bawadi Mediterranean Grill, a middle eastern restaurant in a south suburban strip mall where I found that a menu of familiar favorites was distinguished by unusually fresh and bright flavors, ranking among the best of such things as shawerma, falafel and baba ghanoush that I’ve had lately. Actually, credit for finding this one goes to my wife. Yes, I was the one who put us on 87th heading toward Harlem to look for middle eastern, but she was the one who spotted Al Bawadi’s sign and most critically, its promise of “Natural Fire Wood Grilled” meats, and fought her way through vicious traffic to land us in its parking lot. It is, let me say, a vast improvement, not only because of the much more pasha-decadent decor (I assume the paisley curtains and pillows are not Arby’s originals) but because the food was simply first-rate throughout. Again, it’s not that anything was anything all that unusual— fattoush salad, hummus and baba ghanoush, falafel, a mixed grill platter with shawerma and kebabs— but it was all really well executed, bright spices, fresh as could be, chicken kebab perfectly cooked and so on. (There are some grilled fish dishes and the like that seem a little beyond the usual.) The only item I hadn’t really seen before was a freebie on the plate of nosh set on our table as we arrived; along with the usual pickled vegetables and some toasted pita, we got a pile of smooshed eggplant mixed with tomato and garlic, lots of garlic. (The precise degree of smooshing was, less than baba ghanoush, but more than a chopped eggplant dish like the Turkish imam biyaldi.) It wasn’t pretty (it sort of looked like brains or something) but it was really good, and I think I just stopped tasting the garlic about 20 minutes ago. So the Bridgeview area is a big 2 for 2 on middle eastern places selected by pure random chance. It won’t be the last time I explore down there, even if I no longer have a traffic court issue that compels me to visit that part of the world. Just as a very silly debate was raging on LTHForum about whether suburbanites ought to be a protected species, their eating habits saved from the indignity of being shot like fish in a barrel by snarky commenters such as myself, I happened to have reason to go to the suburb of Way The Heck South On The Dan Ryan and decided to take the slow way back along Harlem and Roberts Road, looking for actual food down there. There’s a substantial middle eastern presence in that area, and in the past I’ve noted #2’s of a number of the Kedzie middle eastern places; and Steve’s Shish Kebab, formerly on 63rd near Midway, moved there a couple of years ago. But where there’s emigrants from the city, there are probably also brand new spots with no city cousins, and so I decided to hunt up one of those. 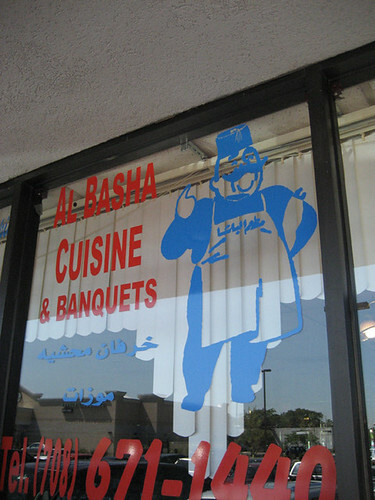 The one I found was Al-Basha, in Palos Heights, located in a strip mall and decorated with this jaunty fellow, who clearly comes from the same school of clip art as the Italian chef on your last pizza box. Inside was not the most encouraging welcome, as the word “banquets” (usually a warning sign) might suggest. The interior was sort of shabby posh, like a place your grandmother would go for brunch in Boca, and there were half a dozen parties scattered around the larger room, most of them smoking (it’s always surprising now to smell smoke inside a restaurant). No one appeared to be in charge, and finally a large fellow lumbered out and provided service that seemed intent on defining the precise line between lackadaisacal and neglectful, though it did, at least, come with housemade pickles. One bite made me ashamed of my snark-filled doubts. Okay, maybe two or three bites, but that’s all. This was all the standard stuff, but about as good as I’ve had it anywhere, including LTHForum fave raves like Salam or Steve’s. Falafel were freshly-cooked, both beef shawerma and kifta kebab were moist and more flavorful than usual, and one dish seemed even innovative— a combination of hummus and foul, which merely meant a little bit of the latter bean dish was stirred into the hummus, but its earthy flavor added welcome complexity to the usual beige goo. Atmosphere aside, Al-Basha makes me want to go back and keep digging further in this rich, but still fairly unexplored, area for middle eastern food. Today was my first chance this summer to take my kids to do what they’d been doing nearly every day at camp— play in the gentle waters of Albion Beach in Rogers Park, where a sandbar keeps the water at a kid-friendly height. An idyllic day, the sort of day you think you would pick if you were given the challenge of the film Afterlife— in which the deceased are forced to pick a single memory to hold for all eternity. The kids played in utter happiness; but the adult mind is never at rest, and I couldn’t help laying there on the beach, wishing I had a book, an iPod, wifi. Sad, I know. I had my one moment of satisfaction of an adult interest when we went for lunch. The kids love Chipotle, who knows why, but they could do worse than the simple bean and cheese burritos I get them (and pay dearly for). 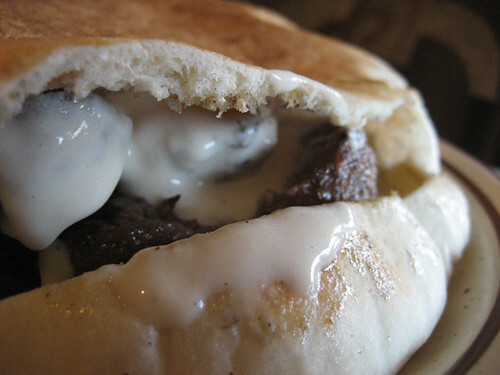 I, however, had my eye on a newly-opened place next door, Pita Grill. There were both promising and unpromising signs. Unpromising, hot dogs and hamburgers figuring prominently. Promising, a cake display full of mucver, the fried zucchini fritters available at a few of the local Turkish restaurants, such as Nazarlik (where I think they’re the best thing to be had there, frankly). Unfortunately it was impossible to get kebab meat of any sort and not get great heaps of fries or rice, I wanted hummus or something like that as a side, so the eager counterman, seemingly happy that someone was asking him for something that wasn’t all-American, pointed to a falafel and hummus special. I was sold. It was okay. 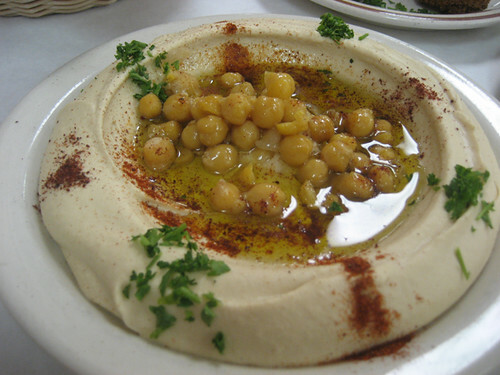 The hummus was fine but nothing special, the falafel was a little rubbery, somewhere in between fresh and not-fresh. Pita Grill seems like a place that wishes it could be better but has already been beaten down by the reality of its location in a hot dog-eating neighborhood. The kids were happy with everything— their burritos, their day at the beach with Dad, the bottle caps they found on the street, which they evaluate in terms of perceived rarity (Dad has to avoid laughing when they pronounce that a Miller Light cap is “really rare”). Their simple, complete happiness is the most contentment I can wish for, some days. Retroactively declared #2 in my 50 new restaurants challenge.